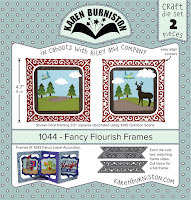 Can I start this blog post by saying that I am so excited to be part of the Karen Burniston Design Team and being able to play along with the rest of the very talented ladies on the team? The September Designer Challenge is entitled HOUSE. 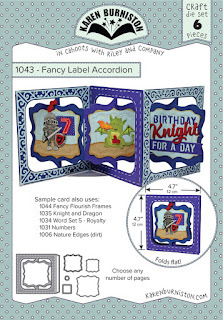 As a new member of the team, I don't yet have the dies from the new September release, which includes a really cool "house" die; but I was able to play along in this month's challenge by using a house stamp and a couple of other Karen Burniston dies -- the Fancy Label Accordion die and the Fancy Flourish Frames. I used just a simple sentiment from the Sunny Studio Christmas Home stamp set on the front, which in reality is actually the back! But when you open this accordion, you'll find my houses. I love the way the Fancy Flourish Frames accent the edges so nicely. Of course, I spent more time popping out those cut-out sections than I did stamping! What a wonderful accordian card for Christmas, Lois! Congrats on your being added to the team!!! Congrats on being part of such a great team!! Have enjoyed all of your creations posted in the Group on Facebook!! Love your card for the challenge!! Have fun ! !